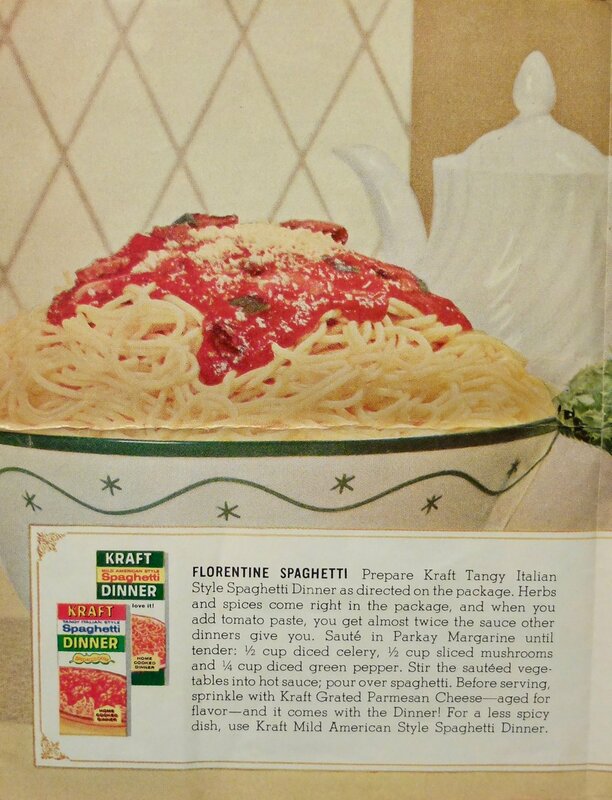 These recipes are both basically ''take a box of spaghetti, make a sauce, then eat it!' 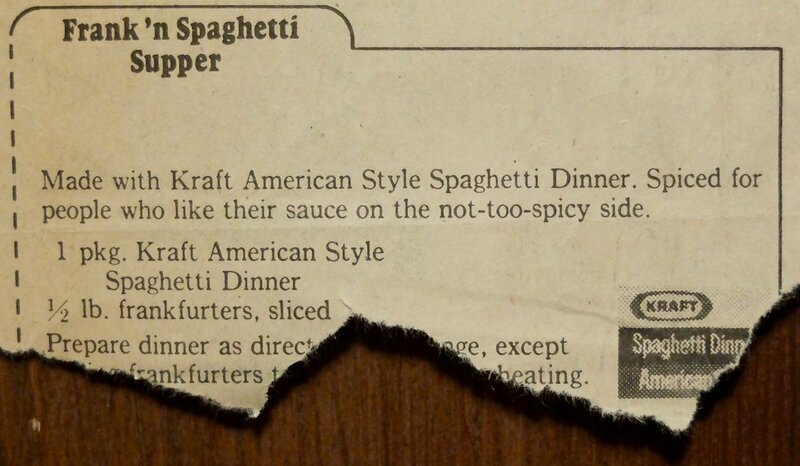 but one of them involves stirring sliced hot dogs (wieners, in the parlance of the recipe, which, since I am 12, is hilarious to me) into the finished sauce. As this sounds revolting, I am lucky because I live in a country with little to no respect for the hot dog so I was unable to find hot dogs and had to make this with chorizo,* thus combining both recipes into a simpler single version with optional chorizo sprinkles. Since both recipes require some kind of pre-made sauce base that obviously doesn't exist anymore, I made my own sauce from scratch (-ish) using their additions to dress it up. I had mine with chorizo and Judson tried it without, so you can make it either way, or, if you're feeling really authentically 1950s, go ahead and stir in some sliced hot dogs. What could be better? I made this for us one night when it was raining (not snowing for once!) and I couldn't be bothered to cook anything that required much thought but still wanted to be in the kitchen because it's always the warmest room in our flat. I really love mindless cooking like making pasta sauce or chili sometimes- the kind of thing where you just chopchopchop sizzlesizzlesizzle simmersimmersimmer taste and adjust, then start again from the beginning. I love zoning out to an old episode of the Golden Girls, my favourite playlist, or an audiobook (my newfound passion- I can read twice as many books at a time now! ), listening to the rain and filling the kitchen with steam and good smells until it's time to eat, and this recipe is no exception. 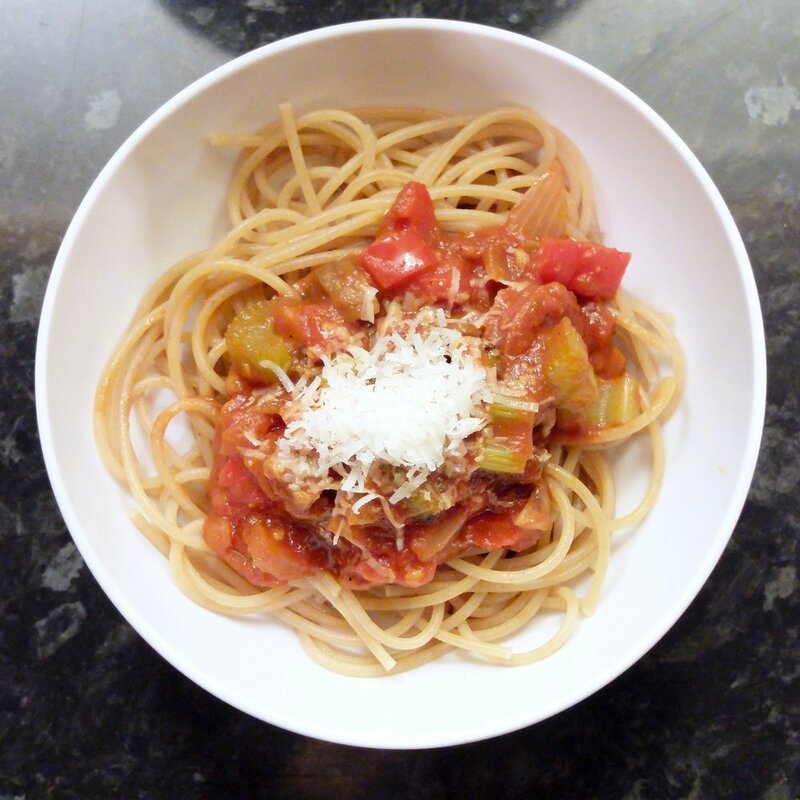 Very much intended to be a 'clean-out-your-fridge' type recipe, this sauce is the kind of thing you'll never make the same way twice because it's completely dependent on what you've got to hand; have an open jar of anchovies you need to use up? Throw 'em in! A stalk or two of celery that are going soft? Chop 'em up! Half an onion, one shallot, and a piece of leek? In they go! A carrot? Fine! A handful of strawberries? WHOA, no. This is not a free-for-all, you know. Anyway, here's how I made mine, based on what the original recipe recommended to add to a prepared sauce base, but as I said, edit it to your heart's content. You can cook this for as little as 30 minutes including softening time, but it's going to keep getting better the longer you leave it, so if you have time, do your prep a few hours before you need it and then let it simmer for a few hours so the flavours really blend. It'll be worth it. *Truly, this country has so little respect for the hot dog that the only ones I have ever seen in my shop come full-length in a can packed in water, and the label is, of course, an American flag. Once upon a time, the existence of those water-packed canned weiners was the most embarrassing thing about being an American abroad. 3 spoons out of five. 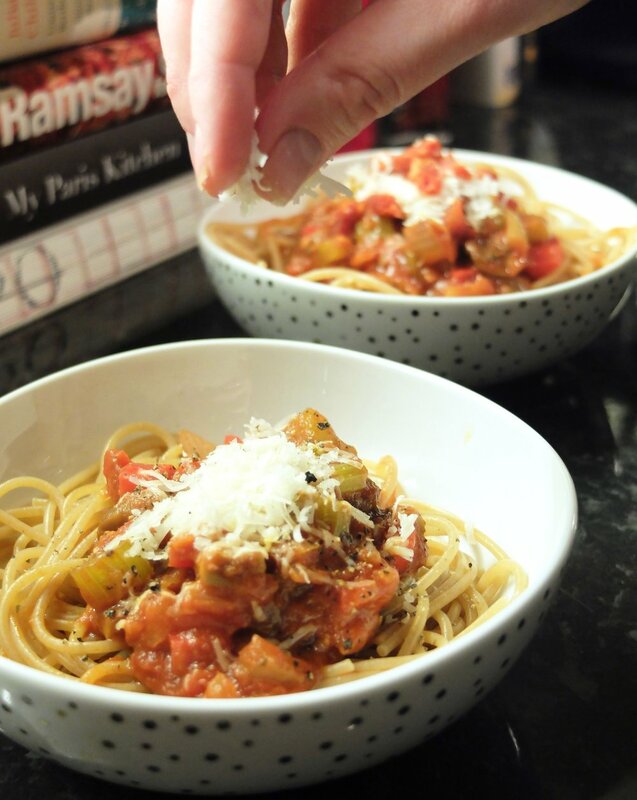 I'm knocking off one spoon because this is no spaghetti bolognese made with fresh tomatoes when they're actually in season, but for a recipe that cleared out my fridge of all the veg I would otherwise probably have had to toss, it's great. And I'm knocking one more spoon because the chorizo didn't really add anything and I can all but guarantee the requested hot dogs would have been even worse. Saute the anchovy in the oil in a deep saucepot until it melts. Add the celery and stir well, reduce heat to medium-low and cook for 4 minutes, until slightly softened. Add the garlic, onion, bell pepper and mushrooms and continue to cook, stirring frequently, until well-softened and slightly browned, at least 10 minutes or up to 20 minutes. Deglaze the pot with a generous glug of wine, turn up the heat to medium and add the tomato paste. Stir to combine, then add the passata and stir well. Bring to a simmer, add red pepper flakes, then taste. If needed, add sugar, salt and additional red pepper flakes. Reduce heat to medium-low and either allow to simmer with the lid on for up to an hour, or cook your spaghetti.